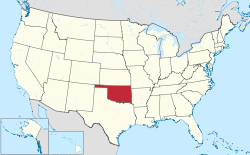 Oklahoma is a state located in the Southern United States. According to the 2010 United States Census, Oklahoma is the 28th most populous state with 3,751,616 inhabitants but the 19th largest by land area spanning 68,594.92 square miles (177,660.0 km2) of land. Oklahoma is divided into 77 counties and contains 597 incorporated municipalities consisting of cities and towns. 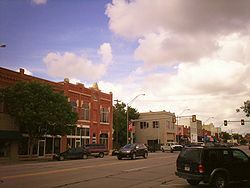 In Oklahoma, cities are all those incorporated communities which are 1000 or more in population and are incorporated as cities. 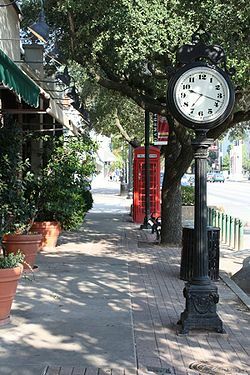 Towns are limited to town board type of municipal government. Cities may choose among aldermanic, mayoral, council-manager, and home-rule charter types of government. Cities may also petition to incorporate as towns. Population data based on 2010 Census. Over 10,000 people. ^ "Census Regions and Divisions of the United States" (PDF). U.S. Census Bureau. Retrieved June 9, 2016. ^ "Annual Estimates of the Resident Population: April 1, 2010 to July 1, 2016". United States Census Bureau. Archived from the original on August 15, 2014. Retrieved May 28, 2017. ^ "2010 Census Redistricting Data (Public Law 94-171) Summary File". American FactFinder2. U.S. Census Bureau, 2010 Census. Retrieved May 28, 2016.